This course applies to all construction, renovation, and repair projects including temporary construction that includes security fencing and gates. Security fences and gates are installed and used primarily to define the perimeter of protected areas, such as restricted areas, controlled areas, entry control/access control points, installation perimeters, and to provide a physical and psychological deterrent to entry and preventing unauthorized personnel from entering a protected area. Security managers, security personnel, planners, designers, architects, and engineers may use this information when evaluating existing and providing new security fences and gates. This course is not intended to address procedural issues such as threat levels or to provide specific design criteria such as vehicle impact forces. This course is intended for civil engineers, and other design and construction professionals wanting an introduction to the fundamentals of security fences. This course will give engineers and others an introduction to design of security fences. 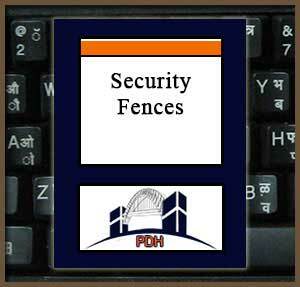 This is an introduction to security fences in many applications. After completion of this course you will have an understanding of materials and construction methods for security fences and accessories.